I laughed and smiled at "Going in Style," the Zack Braff remake of the 1979 George Burns comedy, starring Michael Caine, Morgan Freeman and Alan Arkin as three fed-up senior citizens who decide to do something about it. The plot sounds like the comedy version of "Hell or High Water." The three friends worked for the same steel company, and find themselves old and broke when the company they gave their lives to, moves overseas and dissolves their pension plan. Caine gets a foreclosure notice form his bank, which pushes him over the edge. He talks his friends into robbing the bank that's about to take his house, in the name of revenge and maybe a little end-of-life excitement as well. 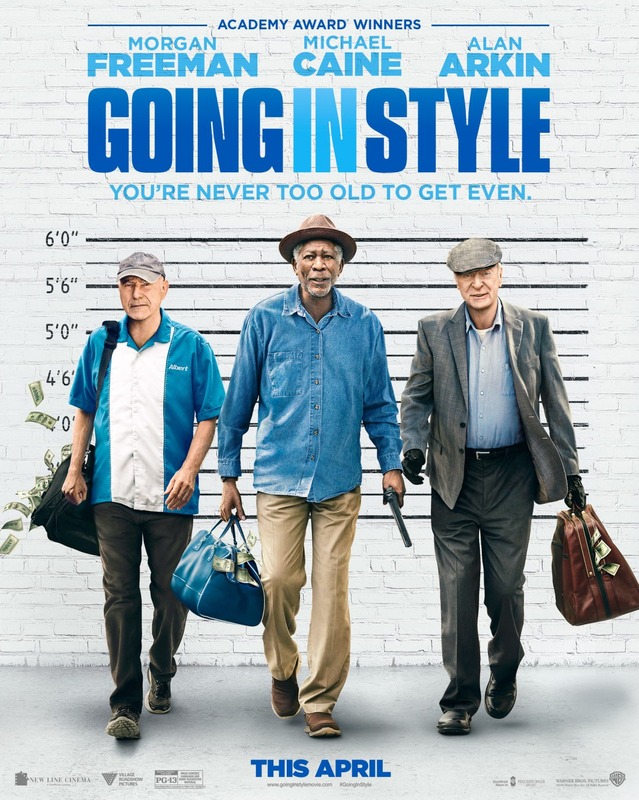 "Going in Style" features a nice cast of character actors, including Matt Dillon as a doubting detective and Saturday Night Live's Keenan Thompson as a supermarket manager who catches the men shoplifting. Old-timers Christopher Lloyd and Ann Margaret also show up, to good effect. Zack Braff directed with a light touch, saving this from turning into another groan-worthy senior comedy. Caine, Freeman and Arkin appear to enjoy each other, and make this material fun to watch. Don't expect anything great, but do expect a good time; and these days, that's often enough. Does it deliver what it promises? Comedy that delivers fun and laughs. Is it entertaining? Fun to watch. Is it worth the price of admission? Just for the fun of it.